Taking a Summer Vacation on the Road? Here's a cute idea to start off your Road Trip Scrapbook. This is the basic idea and hopefully you can expand on it. Let us know if you have a cute idea for a Vacation Scrapbook Layout and we will be glad to post it for you and give you credit for it. 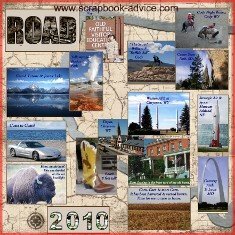 There are several things you can do for your Road Trip Scrapbook Cover page. Here, I used a very old background paper of a map, but you could actually use any map of the state or location you visited. Supplies used: The "Road" was cut from a piece of Bazzill Bling Card Stock in Black. I used a french curve to draw my basic line on the back of the paper and then used a 2 inch piece of cardstock to guide the width of the road. I cut it out by hand. I then used a Silver Metallic Collection Zig Writer Pen to make the dashed line for the center of the road. 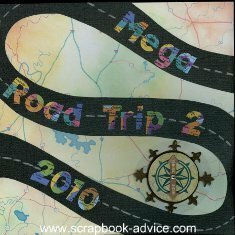 My Stickers for the text "Mega Road Trip 2" were 1.5 inches so I made the "road" 2 inches wide. The stickers are called Chunky Map from Making Memories. The Compass Rose embellishment I received from a Class at the Scrapbook Expo in Duluth (Atlanta), Ga the summer of 2009. Unfortunately, I can't remember who made it. Finishing Touches for my Vacation Scrapbook Layout will be little tiny road signs indicating the starting point of home followed up by each city or stop along the way and the approximate mileage of each. The research has not been completed for this, therefore this page is not quite finished. 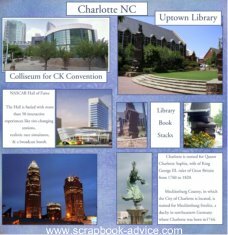 I took a few drives around Charlotte while I was there for the CK Convention in August 2010 and just took some photos of the sites around town. For the first stop included in the Road Trip Scrapbook, I used a number of the photos to show scenes around the park across from the Coliseum. I really liked the bronze stacks of books and the Gazebo in the park that had a lot of road signs to point to various locations. I used short little journaling blocks in white to replicate the gazebo signs. For a girl who has lived for many years in a small town where the tallest building is 8 stories high, the Architectural Tours of Chicago were stunning. Just another stop on the way across this great country and another idea for a Vacation Scrapbook Layout. One interesting thing we did for this trip was to go to a very interesting web site Factory Tours, USA to get some information on breaking up our travel days by including some interesting tours along the way. Using this website, which is broken down by state, we saw some interesting things along the way, learned a good bit, and ate some great samples of chocolate, jelly beans, cheesecake, honey, cookies, tea and wine. We even panned for gold at a gold mine in Colorado and we did keep in mind that we were building memories for our Road Trip Scrapbook and, of course, took photos along the way. 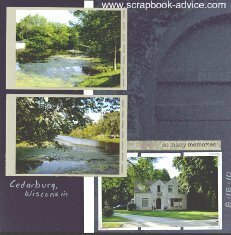 One of our Factory Tours took us to one of the most picturesque towns I have ever been to, Cederburg, Wisconsin to visit the Ceder Creek Winery. 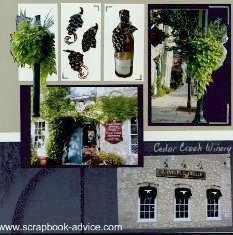 These Road Trip Scrapbook Layouts using Club Scrap's October 2010 Sonoma Kit fit just perfectly for the photos of the winery and the area, and the kit even had the text weight patterned paper that I used to put the menu of the wine choices. 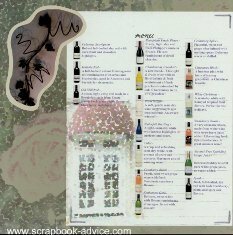 We were to be gone so long we did not want to carry wine across country, so we now have a list of wine to order from upon return home that is safely tucked into the Road Trip Scrapbook - never to get lost. Also included are some photos of nice wine related products that we plan to give for gifts later. This was an interesting and heartbreaking stop along the Road Trip. Just after 9-11-01, I was speaking with a Firefighter from Kansas City, Missouri, who told me about this memorial. As I recall, he told me there were thoughts of donating it to New York. I never heard anything about this statue after that. I had forgotten about the connection and our conversations, and though it very coincidental that I happened upon this during a stop for some food. Even more awesome was the fact that the day I was there was 9-11-2010. 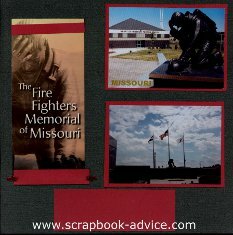 To see some more ideas and Firefighters Scrapbook Layouts and Supplies, click on one of the photos. Just another adventure on the Mega Road Trip and the Road Trip Scrapbook. * Take some photos of packing up your car or all the stuff you need to take. Journal about who's stuff takes up the most space or how long it takes to unpack. * Find a way to take some photos of signs when you cross into another state. I would not suggest standing under an interstate or highway sign, as it's a little dangerous, but you can always get your passenger to try some digital shots from the window as you pass by. Interesting to see what you end up with even if they are blurry, they will show speed and movement. You will be amazed at the way the landscape has a tendency to change, sometimes dramatically, when you cross a state border. 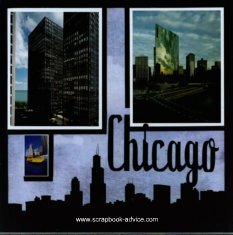 * Keep a Road Trip Journal to use for your scrapbook layouts later. I still have my first road trip journal from 1963. My mother and I really enjoyed that trip and every time I see the journal or even think about it, I have to laugh at some of the things we did. * Keep a Photo Journal of why you took certain photos or specific aspects or notes about a group of shots. Something interesting a guide or park ranger said. Something funny in the conversation that day. Anything to help you remember the good parts. * Use and Print from an Internet Mapping System for mileage and routes and print the maps out to help you remember the path or use the maps for the background of your layouts. * Use Postcards for some of your photos. This is OK and they are always great photos and often taken from a different perspective that you can't get yourself. And don't forget they also have interesting facts on the back that you can supplement your journaling with. * Check out the Gift Shops as many locations now have Scrapbook Kits, papers and stickers to use in your scrapbook layouts and to supplement your stash. Particularly at National Parks. 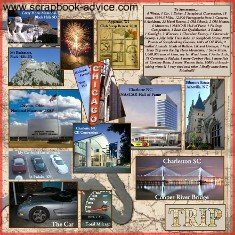 I have some from the St Louis Westward Expansion Arch, Mount Rushmore, Yellowstone, Grand Tetons, Biltmore Estate and many others. * Be careful if you hand someone your camera to take a photo of you. Normally not a problem, but I have heard of a case where the kind bystander just walked off (well, ran) and kept the camera. If you want someone to take a photo of you, use an employee, park ranger, or paid attendant to help you. Get the camera set up with focus and any other options so all your assistant has to do is hold the camera and push the button. * Be careful, also, if you put your camera on a tripod, post or a wall to do a timer or self-photograph. Make sure it is stable and won't get knocked off or blown off it's location or bumped or removed by a passerby. * If you are using a timer on your camera, be careful when you rush back to your position that you don't trip, fall or knock your own camera over. * Remember to take your camera and accessories with you from it's perch. You don't want to have to back track in your road trip and hope your equipment will still be there. Here's an idea that just recently came to me to use for the beginning pages of my Road Trip Scrapbook. I did a page using background paper and an outline of the United States. 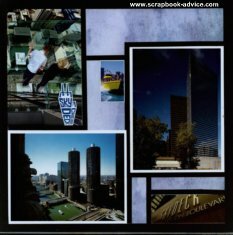 My idea was to put some photos from each place I was on the Road Trip, sort of as a preview of things to come or Summary Page on the inside of the Road Trip Scrapbook. This could have been very easy. The difficult part was deciding which photos to use, but I went to so many places and did so many things, that it was hard to fit them all on. As you can see, I overloaded each of the 2 pages. Photos 28, Titles 3, Journaling Box 1. That's a Record For Me. This would have been a great time to use some of those neat page protectors that open out into panoramic views - which I have - but I forget I had them when I did these. Any way, I hope you get the idea - even though my pages are quite crowded. This just reminded me of all the places and events I have left to scrapbook from my Road Trip of 2010. It was a great reminder and will push me to get more of the individual album pages finished. & 1 very tired soul when I finally came home. Hope You Like The Idea and Will Try It! 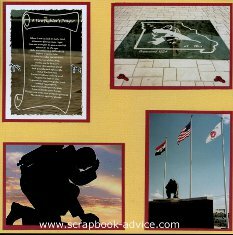 these Ideas will work on any Travel Scrapbook Layout. Best of Luck with your Road Trip Scrapbook Layouts. 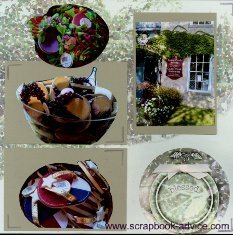 We hope you will come back soon to see some of the rest of our Road Trip Scrapbook Layouts for your Travel Scrapbook Layouts when we get them finished. 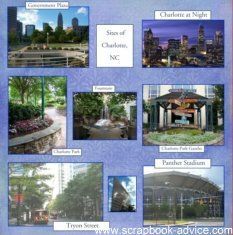 We would love to see your Travel or Road Trip Scrapbook Layouts, so let us know on the Contact Us Page and we can get your Layouts posted with your Name and Trip Information. the Biltmore Estate Scrapbook #1.
or Biltmore Estate Scrapbook #3.
from the Road Trip Scrapbook.